Orangutans spend a lot of time stationary, but when they move it’s spectacular: they literally bend the trees to their will. 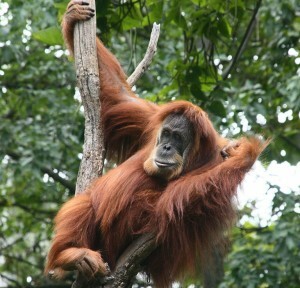 The crash of an orangutan traversing the canopy can be heard a couple of hundred metres away. This helps them move more efficiently, preserving energy. Image: Photos by Matt Adam Williams/OuTrop. From where I sit I can hear the duet of southern Bornean gibbons, proclaiming their territory and reinforcing their pair bond. 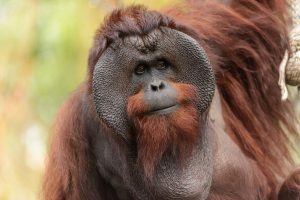 A few minutes ago, a male orangutan issued a roaring long call that sounded more like something from the Serengeti. Crickets are slowly beginning to whirr like chainsaws and birds such as hornbills and bulbuls are starting to provide a tropical chorus that sounds like the backdrop to so many of the nature documentaries I’ve watched. I’m at base camp, on the edge of the Sabangau rainforest in the heart of Indonesian Borneo. This area of 9000 km2 of tropical peatland is home to the world’s largest populations of orangutans and of southern Bornean gibbons. It’s a haven for some of the world’s most exciting and threatened wildlife, from hornbills to clouded leopards. My own love for nature began at an early age when, seven years old, we had a lesson at school about rainforests. I went home and wrote letters to Greenpeace and WWF that evening, who then sent me back posters and leaflets to fuel my budding passion to save the planet. Being based here is a dream. I can jump out of bed, usually at around 4am, throw on some wet socks, damp trousers, and shoes that are still so full of water I feel like I am floating. In high humidity, temperatures approaching 30 degrees by mid-morning and surrounded by swarms of mosquitoes, it’s challenging work. That’s very much how my first ever day following orangutans began. In the small hours of the morning I followed one of the Indonesian field staff and a Western researcher into the forest, to the tree where a mother and infant orangutan had made a nest the previous afternoon. Crouched on the stilt root of a huge tree we sat in the faint orange glow and wispy smoke of our mosquito coils, and waited. Once the orangutans awoke and began moving we followed them for the day, collecting data on their behavior, diet and ranging in the forest. Orangutans spend a lot of time stationary, but when they move it’s spectacular: they literally bend the trees to their will. 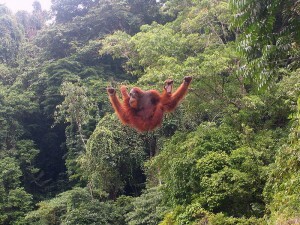 The crash of an orangutan traversing the canopy can be heard a couple of hundred metres away. This helps them move more efficiently, preserving energy. So, while this job often means early starts and long days, it’s also a great privilege, one that’s afforded me by working for the Orangutan Tropical Peatland Project (OuTrop), a research and conservation organisation based here in Central Kalimantan province of Indonesia. We focus our efforts on three key primate species: Bornean orangutans, southern Bornean gibbons and red langur monkeys. Through daily data collection OuTrop students, staff and interns here are gaining new insights into the lives of these animals. Our team also includes local staff, whose expertise enhances our ability to discover and protect this special place. Beyond primates, the research covers butterflies, birds, and plants. We also support conservation efforts and the work of a local Community Patrol Team, managed by CIMTROP at the local University of Palangka Raya. Previous logging in the Sabangau forest has left behind canals that drain the forest of water, leading to trees falling down and making the forest more vulnerable to fire. Damming these canals is needed to protect the forest. In our forest nursery we grow seedlings, which are then replanted as part of an effort to learn more about how best to reforest areas that have burned or been degraded. This work is vital. 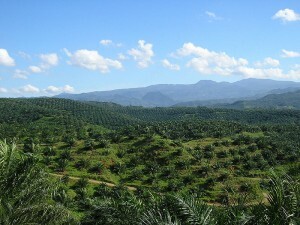 For many reasons, from conversion to palm oil to illegal logging, forests such as Sabangau are at grave risk. But organisations like OuTrop provide hope that these trends can be slowed, maybe even reversed. 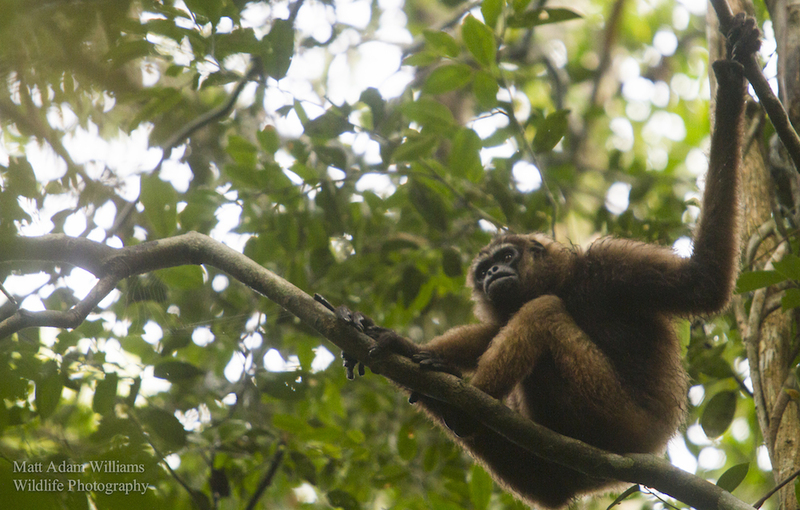 The research we conduct reaches far beyond the edges of the Sabangau forest, building the case and evidence needed to argue for better protection of such habitats everywhere, and providing the know-how to design effective conservation approaches. It also helps to build capacity for local staff and the aspiring conservationists who come here from across the world, such as myself. 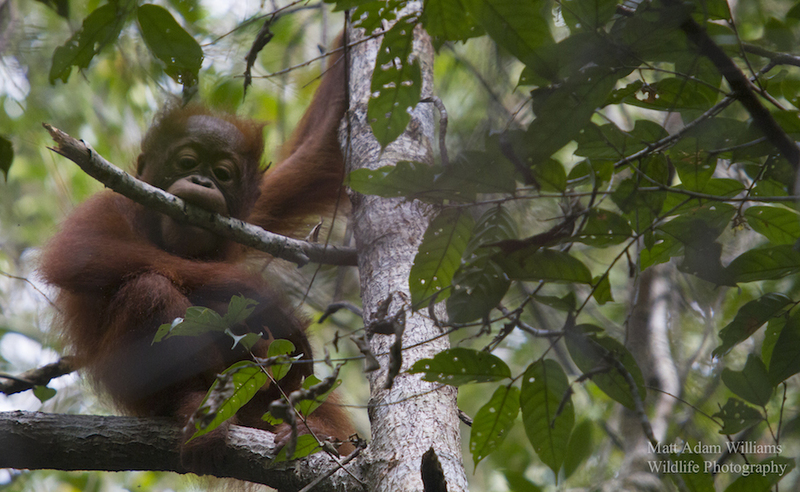 Alongside a range of other organisations working in Indonesia, and with the generous support of our funders, OuTrop is on the front line of tropical forest and orangutan conservation. I still harbor the same burning passion to save nature as my seven year old self did. This fire drives me to get out of bed every morning, to watch and photograph nature, and to share my passion with others. Now I’ve found an organisation that’s already doing this in the one place I always dreamed of making a difference: the rainforest. If you’re interested in working with OuTrop, visit outrop.com/join-us. Matt Williams is a conservationist, writer and photographer. He began his conservation career early, joining the Royal Society for the Protection of Birds at the age of five. He currently works as Communications Manager for the Orangutan Tropical Peatland Project in Indonesian Borneo. You can follow his adventures in the jungle @mattadamw and find more of his work at mattadamwilliams.co.uk. The views expressed here are his own and not those of OuTrop. Photos by Matt Adam Williams/OuTrop. Further updates to the IUCN Red List of Threatened Species was released during the IUCN World Conservation Congress earlier this month.